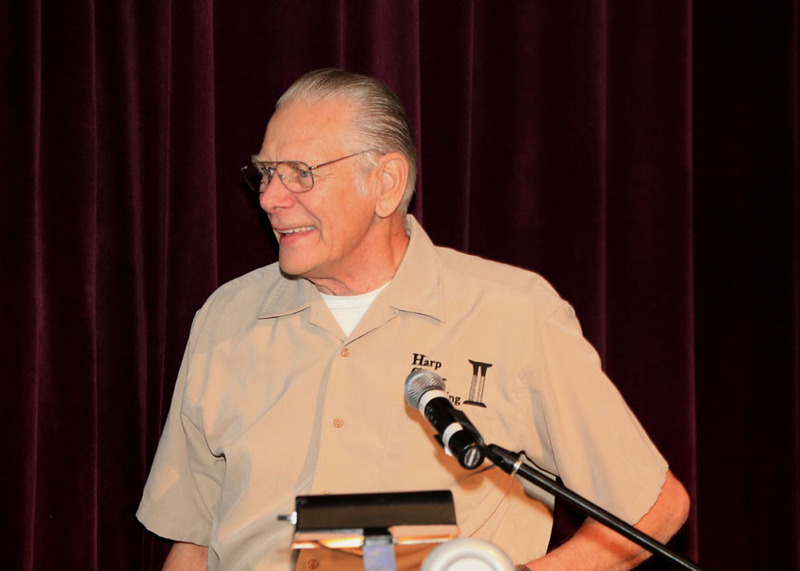 No sooner did we wrap up Stephen Bennett’s surprise tribute, than we had something in store for another “living legend” – Bob Hartman! Actually, it should’ve followed immediately, but we all sat there waiting for the secret guest of honor for a good ten minutes, as no one knew that he was next door being interviewed for the new Nealham/Powells film project, since he of course had no idea he was about to be feted onstage. What a comedy of errors. 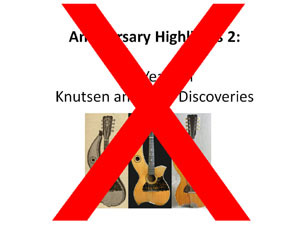 Finally, he and wife Carol arrived, and we plopped them in the first row exit so that he could “be ready to come up and help me with my presentation,” titled Anniversary Highlights 2: Ten Years of Knutsen and Dyer Discoveries. Again, I immediately x’d out the openinig slide as we surprised Bob with his own tribute. This was Stephen’s idea originally. 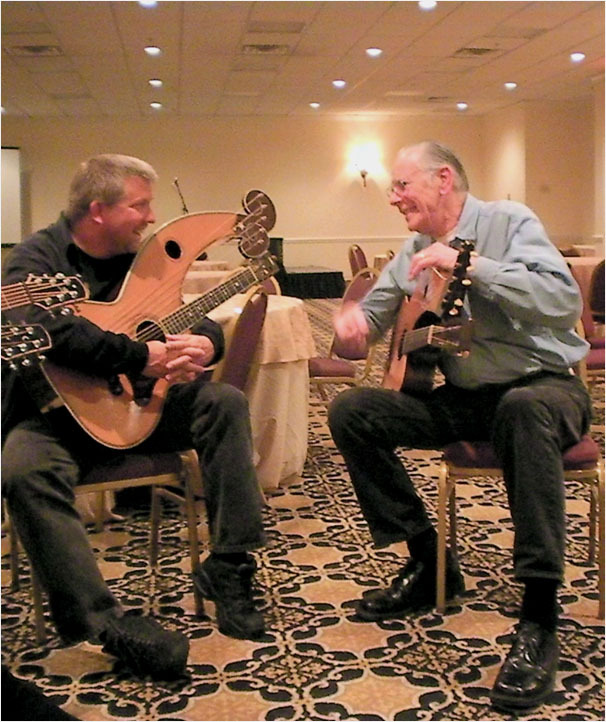 He brought up Bob’s importance to our group (he’s been to every single Gathering) – via Bob’s relationship (grandson) to Carl Larson, half of the legend that gave the world the Dyer harp guitar. Most of you know Bob’s books on the subject (what I alluded to as his continuing series of “final editions”). He has shared this information, along with various new discoveries, during presentations (alone, or with myself, or, last year, John Thomas) at every Gathering but one. I gave a Down Memory Lane slideshow of those segments, including Bob’s special displays of original Larson tools, new instrument discoveries he brought with him, and Bob enjoying himself in the jam sessions – whether playing some Larson harp guitar, or just listening – at every event. 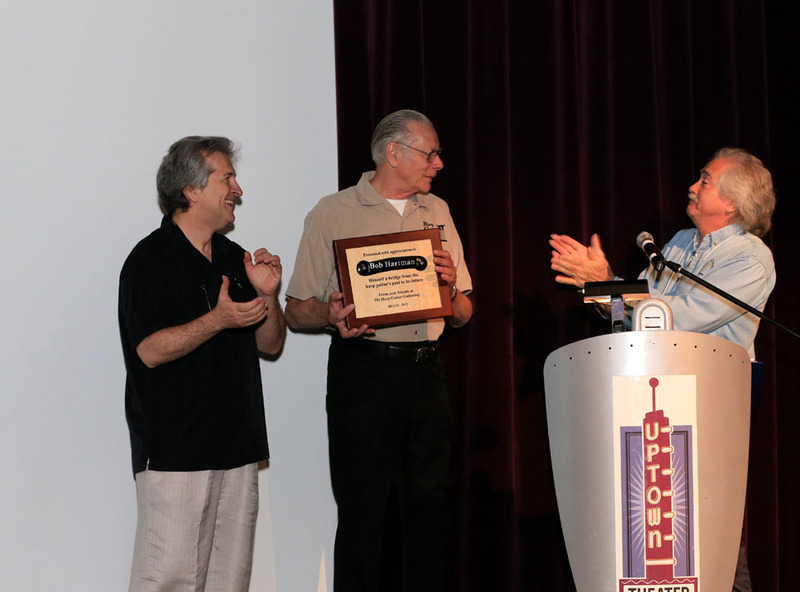 Stephen had suggested presenting some sort of plaque to show our appreciation for Bob’s efforts and acknowledge his contributions to our community, “as a unique bridge linking the present and the past.” So – cool visual pun – maybe a graphic depicting a Dyer bridge? 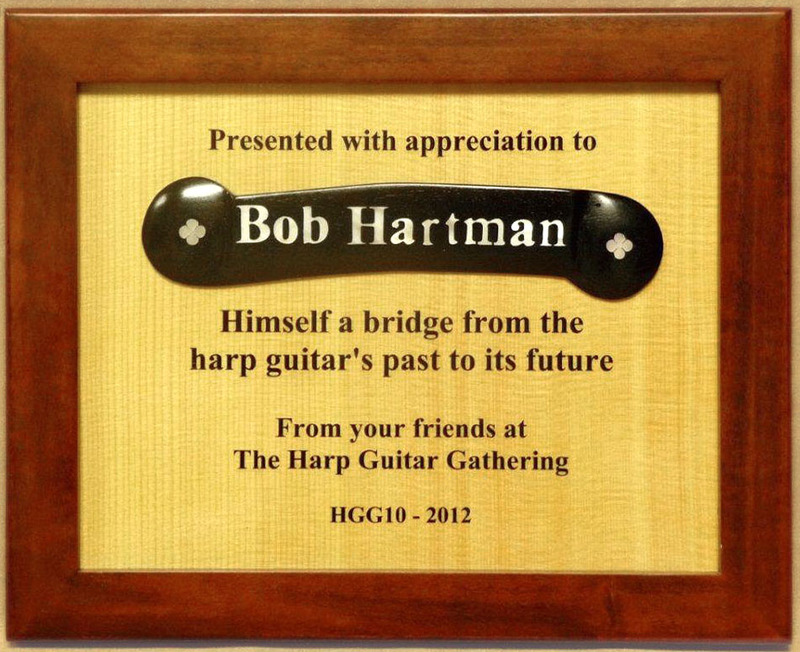 It was no small effort to create an authentic bridge that would also incorporate Bob’s name in pearl inlay. Then mount it to an authentic piece of Adirondack spruce top in a frame (no, Don didn’t go so far as to test it for “tap tone”). The hardest part was the rest of the lettering, which he at first tried to have laser engraved, but ended up with a tricky decal. 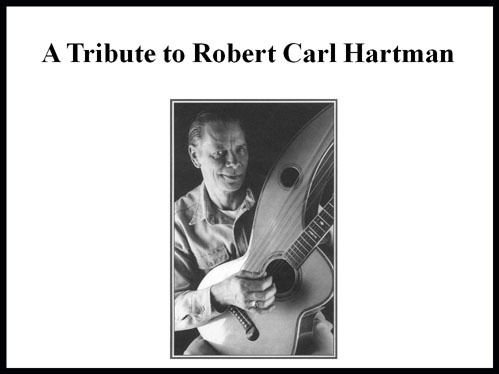 We think the end result was a fitting tribute to Robert Carl Hartman, our friend and fixture of the Harp Guitar Gathering, who not unexpectedly teared up a bit before his near-speechless “thank you” speech. Next up: Oleg Timofeyev and the Russian Harp Guitar! 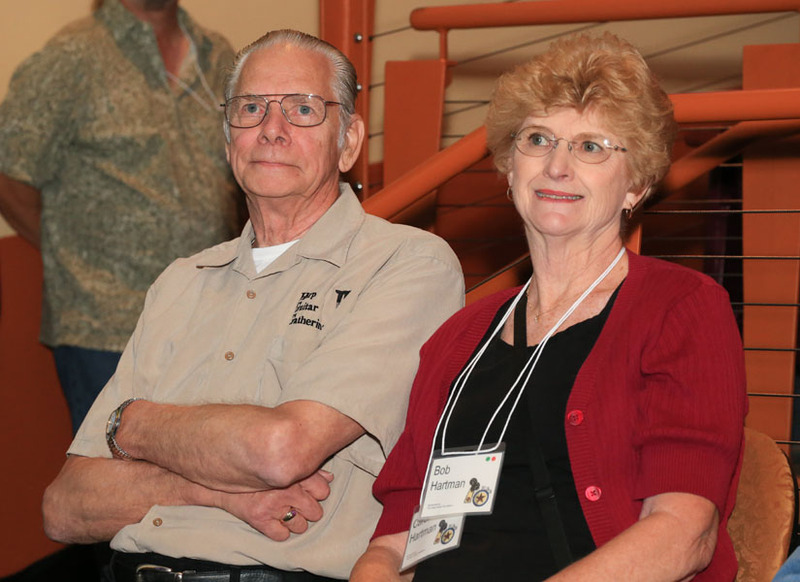 Thank you Bob and Carol for being there year after year! It truly would not be the Gathering without you. p.s. and thank you Don! I was astonished to be given the wonderful tribute with all of it’s lauds and levities!! 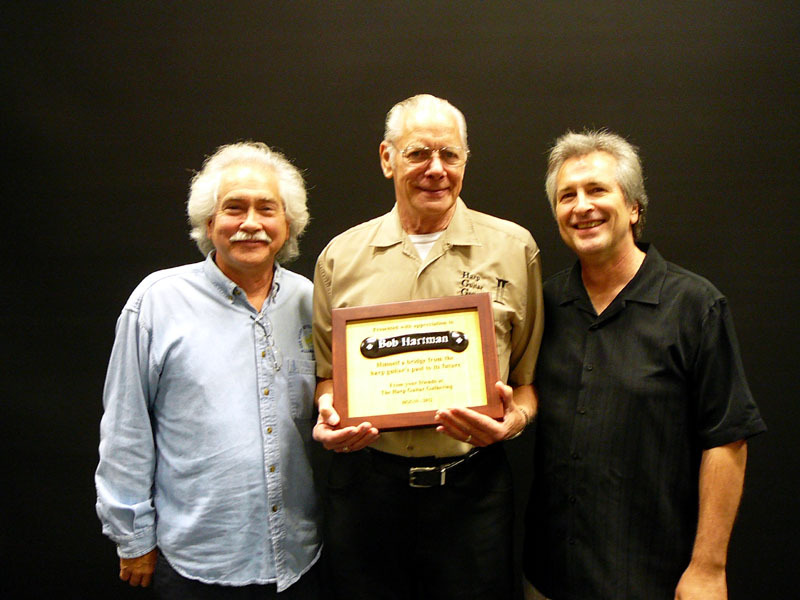 Along with Don’s award, Stephen, Gregg and any accomplices are to be equally commended for the thoughtfulness and the valuable time spent in the compilation of the production. What a painstaking job Don Duckenbrodt did, taking many hours to complete such a work-of-art with the ebony Dyer bridge and my name in pearl mounted on a real piece of spruce! Don, I thoroughly appreciate that you would take the time for me, since we hadn’t even met. Carol and I are so happy to have been at all the fabulous Gatherings and are already looking forward to next year. 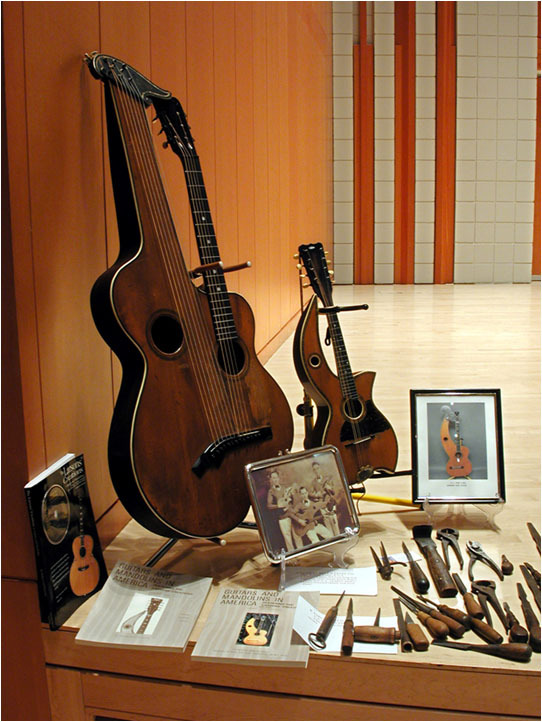 on the Harp Guitar Foundation. A big thank you to all the previous hosts, Stephen Bennett, John Doan, Andy Wahlberg, Mike Doolin, Brad Hoyt, and Co-Host, John Thomas. Maybe Carl and August are looking down on us with a smile. 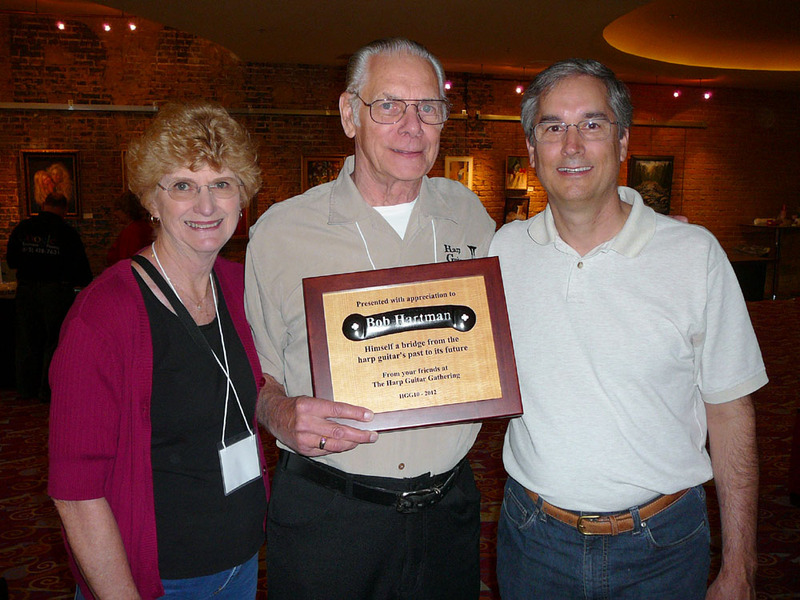 I deeply thank them for leaving this wonderful legacy in my care! Super tribute to a super couple.